Whether it’s a rally car storming across a bumpy gravel road or a Formula 1 car speeding towards the famous Eau Rouge corner at the Spa-Francorchamps F1 track, motorsport offers thrills to all proper petrolheads. Motorsport is entering interesting times, as new technology is being introduced to racing. 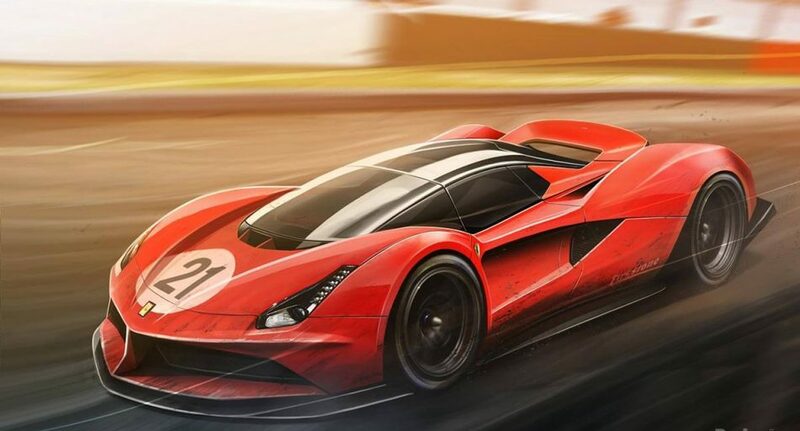 But its history is full of amazing cars, and we like some of them so much that we’ve reimagined what they might look like with a more modern spin. When the Porsche 917 made its appearance, everybody knew it would change sportscar racing. After all, it could reach over 245 mph on the famous Mulsanne Straight of the 24 Hours of Le Mans circuit. The car took Porsche’s first overall wins in the famous endurance event in 1970 and 1971. Our modern version combines the designs of the 918 and Mission E with 917’s body, all finished with Gulf livery. The BMW M1 Procar Championship – Procar, for short – was a one-make racing series that ran in 1979 and 1980. The idea of the series was to put drivers from Formula 1, the World Sportscar Championship, the European Touring Car Championship, and other racing series in similar, modified BMW M1 sports cars. Our car is inspired by the modern BMW i8 and has some touches of the BMW Vision i Dynamics. Of course, it comes in M colours livery. Next up: rallying. The Lancia Stratos is one of the most recognisable and legendary rally cars. It won the World Rally Championship in 1974, 1975 and 1976, and it was driven to victory in events including Rally Monte Carlo, Rally Sanremo and Rally Corsica. Such iconic drivers as Sandro Munari, Björn Waldegård and Markku Alen sat behind the wheel of the classic Stratos. Who might sit behind the wheel of this version? Last year, Sir Stirling Moss’s 1956 Aston Martin DBR1 sold at an auction for a whopping £17.5 million (AUS$32.2 million)! We think this legendary car has potential for a remake – so long as it honours the tradition. We kept the same body type but made a few modern modifications: one-seater on one side only, with modern design lines from the Aston Martin 2018 Vantage and Valkyrie. The familiar British green colour with decals completes our tribute to this great sports car. Audi stopped rallying in 1986, when they switched to circuit racing and headed to the USA to boost the American market. The German brand adopted its rallying experience and technology to racing, and it’s said that IMSA Audi 90 GTO was one of the wildest and most advanced four-door racing cars when it entered the 1989 IMSA championship. It also happens to be our favourite. This version takes cues from the new Audi R8, while keeping the same boxy body style and Audi Quattro livery. The 1967 Ferrari 330 P4 had a V12 engine and was designed for endurance racing. Behind the development was the fact that John Cooper revolutionized the racing world with his mid-engine F1 cars in late 1950s, and Enzo Ferrari wanted to ensure Ferrari retained its dominance in endurance racing. The 330 P4 was born, and only three were ever produced. Our modern version takes design cues from the latest LaFerrari FXXK and comes in the brand’s racing livery. Jaguar D-Type is a classic sports car that was influenced by the aviation industry and produced from 1954 to 1957. It won the famous Le Mans 24-hour race three times during its production period, conquering five of the top six places in 1957. We love the rear wheel covers that make the car stand out and kept that same style in our modernisation. The new D-Type is inspired by the C-X75 and the takes some design cues from the modern XJR-12. We know that McLaren’s F1 cooperation with Honda didn’t live up to expectations and ended last year. But the duo produced one of the most dominant F1 cars ever: the McLaren MP4/4, driven by Ayrton Senna and Alain Prost in 1988. Its winning percentage is a stunning 93.8%. Our version has the same red and white livery, which decorated McLarens in F1 until 1997. These designs are a tribute to the legendary motorsport cars of days gone by. Which one would you like to drive?